The New People’s Army is the subject of AFP Chief Bautista as he claimed that the group will not last another five years or it will lose relevance in the years to come. 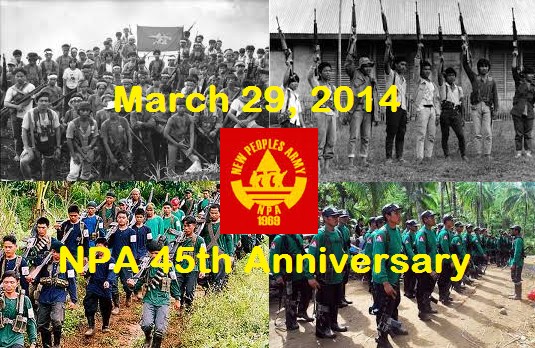 CPP-NPA 45th Anniversary is today March 29, 2014. We know for a fact that this group fought for their rights and their hurts and pains in the government that they needed to go to the mountains and live a life different from the mainstream people. The group has been controversial for so many years with their activities and according to the AFP Chief, the group has no ideology and they are resorting nowadays to extortion. Another heavy statement came from AFP Spokesman Maj. Gen. Domingo Tutaan Jr. saying that today is NPA’s 45th year and they are commemorating the long years of sowing fear against the Filipino people. This is something that depletes the purpose of the said group. Though these are the statements coming from the AFP, the CPP claims that the NPA is gaining 10,000 high-powered firearms. They are also looking forward to the rapid expansion of the group members of around 25,000 fighters. Recently, two of the prominent leaders of the NPA are facing charges and that is something that the group is doing something. With regards to the case procedure, despite the fact that the group will not abide with the procedure, the case has to continue.